Why didn't this kid get any presents from Santa? He wondered and wondered why he didn't get any presents. He took a close look at the Christmas ball and saw something amazing; there were small engravings on it. He figured out it must be some kind of secret message, but he gave up trying to find out. Can you figure out the secret message from santa, and why the kid didn't get any real presents? The sentence has to be composed by figuring out multiple patterns and creating words out of them, after which you add the blocks of characters together to form a sentence. The dots, Christmas trees, and colors are all individual patterns. The Christmas trees represent binary in some way. 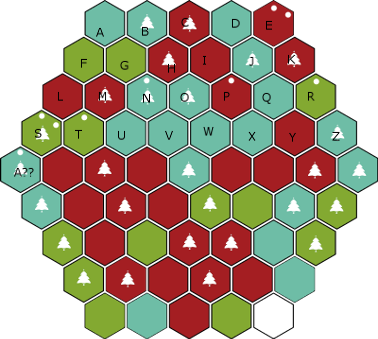 The location of the dots represent one letter. If there are two dots in one hexagon, then there are two occurences of that letter. Spaces are also 'encoded' in each pattern. CHRISTMAS IS MORE TH/AN JUST/ PRESENTS with the A?? dot being a space. Each cell represents a letter. The dots represent how many times this particular letter appears in the anagram (EENPRSST and [space]). The square labeled 'A??' indicates the space. Not the answer you're looking for? Browse other questions tagged cipher enigmatic-puzzle seasonal or ask your own question. Can you crack the Magic Diary's encrypted message? Can you figure out the christmas message? No Christmas presents until you solve this!